A rise in event budgets will be accompanied by an increase in overall costs next year, says a new report by Meeting Professionals International (MPI). MPI’s latest Meetings Outlook report suggests industry professionals will have to 'dig deep into their bag of tricks' in order to stay on budget as costs increase at a faster rate. 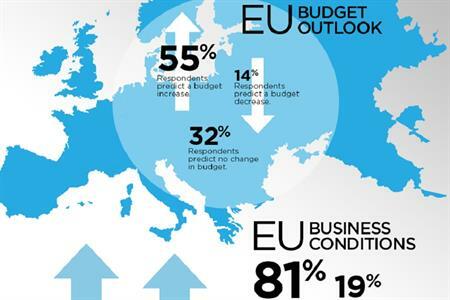 Although 55% of EU planners predict an increase in budgets next year, it is anticipated to be around 1.7 per cent – not enough to counteract rises in costs for goods and services. Respondants listed the areas of most concern as air travel (89%), catering (87%) and room rates (84%). Air travel costs are expected to rise by 5%, with catering increasing by 4%, guest rooms by 3.9%, audiovisual by 3.1% and meeting rooms by 2.5%. Overall, meeting and events business in Europe in anticipated to grow by 3.6% over the coming year, with 81% of survey respondents agreeing business conditions in 2015 will be favourable. "Meeting professionals are bracing for significant hikes in the cost of putting on a meeting," states the report. "However, there’s a flip side to what’s going on; it’s fuelled in part by economic growth that is leading to a resurgence of meetings. Optimism in the EU, hard hit by a protracted economic downturn, is growing. EU meeting professionals anticipate larger amounts of business in the near future, better attendance at both live and virtual events and increased budgets and spending."